Blackjack is the most popular gaming table and can accommodate 7 players. Size is 3' x 5' with a green felt. Requires one dealer. 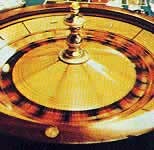 The roulette table is regulation size 4' x 8' with a green felt. It can accommodate up to 15 players. Requires one dealer. 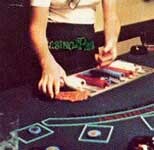 The craps table is regulation size 4' x 10' with a green felt. It can accommodate 16 players. Requires three dealers. The poker table has a green felt. Requires one dealer. Professional casino dealers are available. Their outfits include black pants, white shirt and black tie. They can provide instructions on the rules as well as create a fun atmosphere for a successful event. Each dealer works for 3 1/2 hours and will remain for an additional 1/2 hour for chip redemption time. Treat your guests to Las Vegas gaming nights with regulation size tables and authentic dealers.